Preliminary investigations into Sunday night’s double fatal traffic accident indicate that the tiny Maruti was packed with six people, was speeding and veered onto the wrong side of the road prior to the impact. Sources close to the investigation said that while the exact dynamics of the accident still needed to be established, the account of an eyewitness has shed light on what could have happened on the fateful night. This, along with preliminary tests on the Maruti which excluded any mechanical fault or a burst tyre which could have explained why the car had crossed lanes. 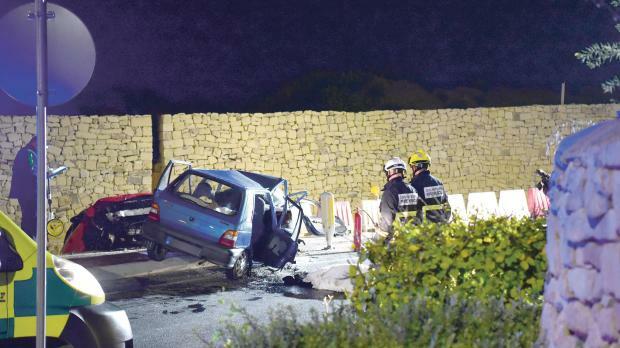 The accident, that claimed the life of a mother and her daughter, happened at about 9pm on Sunday as the Maruti 800 was being driven from Mġarr in the direction of Valletta when it crashed into an oncoming Audi A1. Sources said the collision took place in Triq Temi Zammit, metres away from Triq Buqana which is currently being widened. The Audi ended up in a ditch at the side of the road. The two victims are Żabbar women Graziella Mallia, aged 53, and her daughter Fallon, 31. Graziella Mallia was driving while her daughter was sitting on the back seat right behind her. There were another four passengers in the Maruti which is meant to carry a total of four people, including the driver. They were all taken to hospital for treatment where two passengers, aged 77 and 12 – Fallon Mallia’s son – were seriously injured. A 44-year-old was slightly injured while a 29-year-old from Sliema was unhurt. The Audi was being driven by a 31-year-old from Mosta, accompanied by a one-year-old baby and an 11-year-old child, who were seriously injured. Another child, 10, who was also in the car, was slightly injured. Meanwhile, Infrastructure Malta has denied that its roadworks had in any way contri-buted to the collision. In reply to questions by the Times of Malta, a spokesman said: “Infrastructure Malta cannot comment about specific incidents subject to police investigations and magisterial inquiries. He appealed for reduced speed limits to be observed, both for the safety of drivers as well as workers on site.